¡Fiesta de los Niños! in San Antonio (10am-6pm) Saturday, April 20th. Mayfest in Fort Worth (11am-7pm) daily (Sat.-Sun., May 4-5th) in the Frost Zone. Texas State Fair in Dallas (10am-7pm) daily (Fri.-Sun., 27-29 September). Baytown Nurture Nature Festival (10am-4pm) Saturday, October 12th. Austin Powwow (10am-6pm) Saturday, November 2nd. 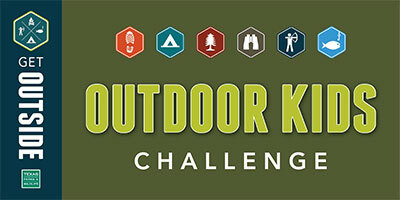 We have a nightly drawing for a Camping Package for youth who enter our Outdoor Kid's Challenge. Introducing families to management and conservation of the natural and cultural resources of Texas and to provide hunting, fishing and outdoor recreation opportunities for present and future generations.